The Facility Standards PDF links contain indexed bookmarks. Be sure that you are using the most current internet browser and PDF viewer settings. Internet Explorer: The PDF indexed bookmarks should display in IE version 8.0 or later. Google Chrome: If the PDF indexed bookmarks do not display by default, click the PDF image in the upper right corner of the browser . 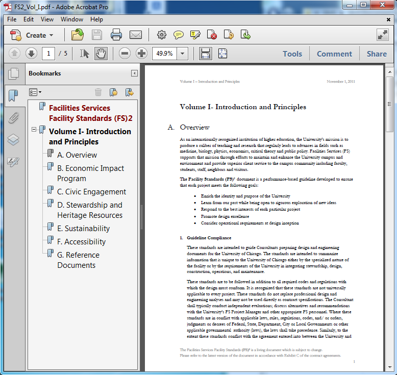 A link from the PDF icon will open the file in Acrobat Reader. Mozilla Firefox: The PDF indexed bookmarks should display in Firefox version 5.0 or later. If the PDF indexed bookmarks do not display by default, click Options/Manage Add-ons/plugins from the top browser menu and install the latest Adobe Acrobat Plugin. Safari: If the PDF indexed bookmarks do not display by default, click Preferences in the top navigation menu. Try selecting different options in the box marked "Display PDF in browser using:”. After following these instructions, if the PDF bookmarked indexed are still not displayed, the last option is to download the PDF file and open it in Adobe Acrobat Reader.